Buttermilk Bran Muffins - Do You Know The Muffin Man? Notes: Well, buttermilk in name only: the supermarket ran out (!) so I used a mix of yogurt and skim milk. For my own version of “fruit explosion”, I used prunes, dried cranberries, golden raisins, dates and walnuts. 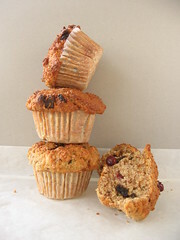 This is one of the easiest muffins to make, but not the tastiest, a fine everyday recipe to have though. These are moist and satisfying, just not remarkable.